Please select an option 18kt rose gold plt. 18kt white gold plt. 18kt yellow gold plt. Please select a color. Please select an option 3pc set earrings -pendant - chain Earrings only Pendant & chain only Please select a selection. Offer this rose to your lady love... So sweetly beautiful, even if we call it by any other name, it would still feel the same..! 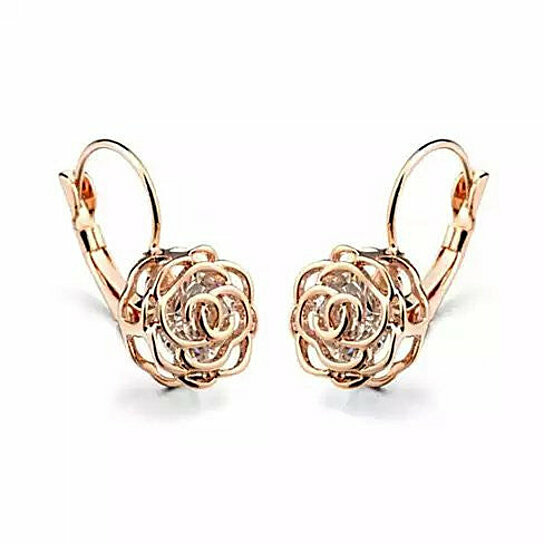 18kt single Rose accent design with 2kt Diamond Crystal which measures 7 mm at the heart of the earrings, makes them timeless. Easy on and easy off style set that everyone can wear and enjoy its beauty. Even more beautiful in person, they come in Rose Gold, White Gold, and Yellow Gold. Great for gift giving to the loved one, they come in a Velvet pouch for gift giving and safekeeping.